Skill, ability, and wisdom are all qualities that would make anyone successful. These are the qualities of a successful businessman, farmer, rancher, welder, or horseman. These are qualities that are better modeled than taught and before they were ever modeled in humanity our Heavenly Father modeled them for us from the beginning. It is fitting that the first person to be spoken of as “filled with the Spirit of God” is not an academic or leadership guru. Nor is it a celebrity or a financial savant, but a craftsman drafted into the service of the Lord. In Exodus 31.2 it says: “See, the Lord has chosen Bezalel son of Uri, the son of Hur, of the tribe of Judah, and he has filled him with the Spirit of God, with skill, ability and knowledge in all kinds of crafts.” The three qualities that the Spirit of God “filled” Bazalel form a distinctive cluster of words that are found a few other places in the Old Testament. He is said to be filled with “skill” or hokma, a word more commonly translated “wisdom”. Biblical wisdom is the tools to live well. It is our life lived and decisions made in response to who God is. Bazalel was also endowed with “ability” [tebuna] and “knowledge” [da’at]. “Ability” denotes understanding; a capacity to see the big picture that comes from a long-life (Job 12.12), an even temper (Prov 17.27) and a hold on the tongue (Prov. 11.12). All of these things will contribute to a life lived without need for a course correction (Prov. 15.21). Bazelel was a man of the big picture, able to keep true to the direction and the plan. “By wisdom [hokma] the Lord laid the Earth’s foundations, by understanding [tebuna] he set the heavens in place; by his knowledge [da’at] the deeps were divided, and the clouds let drop the dew.” (Prov 3.19-20) Creation was the original meeting place of God and man. It was the first communion between our Heavenly Father and us. No veils, no separation, no distance. True face to face communion and communication fostered by His wisdom, understanding, and knowledge. The Tabernacle. “…the Lord has chosen Bezalel…and has filled him with the Spirit of God, with skill [hokma], ability [tebuna] and knowledge [da’at] in all kinds of crafts.” (Ex. 35.30-31) The tabernacle was the sanctuary of God during the time of wandering in the desert up until the Temple was built by Solomon. (2 Samuel 7.6; 1 Chron. 23.26). In it resided the Ark of the Covenant, the Table, the Altar of Incense, the Altar of Burnt Offering, the Wash Basin, and all the other things need for worshipping the Lord. Everything that resided in the Tabernacle, and the Tabernacle itself was under the skill and supervision of Bezalel and the Spirit that filled him. The Temple. David wanted to build it (1 Chron 28.2), he was given the plans for it (1 Chron. 28.12), but was told by God that Solomon would do it (1 Chron 28.6). Solomon undertook the building of the Temple (1 Kings 6), but hired Huram who “was highly skilled [hokma] and experienced [tebuna + da’at] in all kinds of bronze work. He came to Solomon and did all the work assigned to him.” (1 Kings 7.14) The ark was brought from Shiloh to the Temple, where God’s glory filled His new dwelling place (1 Kings 8.10-13). What ties all of these together is not just the words but also the implication of God’s presence. These were all places where God dwelt with Man. In the Garden/Original Creation, God would walk with man in the “cool [ruach] of the day” (Gen. 3.8). Sin broke our relationship and made hiding desirable. There would be no more walks with the Lord and no more seeing His full glory. For year’s there would be intermittent contact with God. People knew that he was with him (even non-Hebrews could see that [Gen. 39.3]) but there was no lasting place for God to dwell among His people until He gave Moses instructions for the Tabernacle. Moses was to “make a sanctuary for me, and I will dwell [sakan] among them. Make this Tabernacle…” (Ex 25.8-9) The tabernacle was God’s dwelling place in the center of the Hebrew camp. When they entered the Promised Land it was set up at Shiloh, where God would eventually say “Go now to the place in Shiloh where I first made a dwelling [sakan] for my Name…” (Jer. 7.12) But the Tabernacle would eventually be replaced by a building designed by God, communicated to David by the Spirit, and built by the oversight of Solomon and the hands of Hiram. In the Temple at Jerusalem would now be where God’s name would dwell (Neh. 1.9; 1 Kings 8.12). God, however, would soon find another way, a different way to dwell amongst his people. John writes: “The Word became flesh and made his dwelling among us.” (John 1.14) Jesus was God’s representative to this world for 33 years until he sent his replacement, the Spirit, to make his dwelling in us (1 Cor. 3.16). We are now the vehicles by which God meets others. We are the carriers of his wisdom, skill, understanding, and ability. We not only bear the image of the one who created us, but we are indwelled with the very qualities that God has meet with humanity for ages. As we walk through the day, as we undertake a project, as we comfort those around us, as we interact with others, we are the meeting place where God’s character meets others…its our job to let Him do His thing. I will admit that the first 30-40 minutes of the documentary was applause worthy. 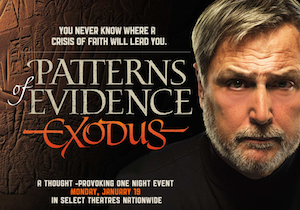 With liberal archaeology dominating the news, the internet, documentaries, and television, to have a movie of this magnitude and this quality championing the physical evidence for the Exodus is exciting. Tim Mahoney made a great movie in response the questions surrounding the Exodus but around 30-40 minutes into the movie, however, entered a man named David Rohl. SPOILER ALERT: The thesis, contents, and conclusion are for the most part a synopsis of Rohl’s book Pharaoh’s and Kings: A Biblical Quest (1996). In this book, Rohl attempts to reconfigure the Egyptian Chronology stating with Ashurbanipal’s sacking of Thebes in 664 B.C. and working backward. The problem that Rohl’s solution causes is the amount of time between his date for the exodus (1450’s which conservatives would for the most part would agree with as 1 Kings 6.1 points to a 1446 BCE Exodus) and the fall of Thebes (664 BCE) is hardly enough time for the 10 dynasties of Egypt to reign. He does remain in the ball park with his 1450’s date with the Berlin Pedestal giving the earliest extra-biblical reference to Israel (predating the Merneptah Stele by 150 years). His truncated time table places Ramases II as the Biblical Shishak who invaded during the reign of Rheboam (1 Kings 14.25) which means there needs to be more work done with the Bubastite Portal (a record of Shoshenk I [Shishak] march into Palestine). This also calls for an overlap of the 21st and 22nd dynasties. The chronology of Egypt does not seem to be on their side. Rohl’s revised Egyptian Chronology attempts to solve the chronological issues in Egypt, but fails when it comes to Palestine. His shortened time span between the Exodus and fall of Thebes boxes in the Amarna period, the time period of the famous letters (which are usually dated to the time of the Judges), into the beginning of the Divided Monarchy (300 years after Judges). One of the famous authors of a letter is Labayu, king of Shechem. In the Canaanite language “Labayu” means “lion”. David, in Psalm 57, a Psalm written while he was on the run from Saul, mentions that he is “in the midst of lions”. This gives rise to Rohl’s identification of Labayu with Saul, a far-reaching stretch linguistically and archaeologically if there ever was one. His archaeological record in the past has been a bit suspect as he claimed in his book Legend: The Genesis of Civilization, to have discovered the location of the Garden of Eden and the place where Noah’s Ark landed. In this documentary, he claims to have found a statue of Joseph (if not Joseph someone whose career and life was very similar). The statue was a Semite, with a throw-stick, a colorful coat, in a palace, atop a 4 room house, at Avaris. Mahoney and Rohl both made claims that this was probably Joseph. Here are the issues however, A) as far as being a Semite, Avaris was the Hyksos Capital. The Hyksos were foreign-Asiatic-Semitic-rulers in Egypt during the 12th-17th dynastys who set up their capital at Avaris. B) the throw stick was so common to the Cannanites that they Egyptians adopted it as a hieroglyph meaning “Asiatic”. C) The colorful coat that covered the statue was not uncommon to the time period as the Beni Hasan Tomb Painting would convey. D) As aforementioned, the Hyksos set up their capital at Avaris, so a place to honor an Asiatic ruler would be expected. Chances are good that this could be any other Asiatic ruler and without any epigraphic evidence, to claim the statue was biblical Joseph is academically irresponsible. Rohl believes that they Hyksos moved into the land of Egypt to fill the power vacuum after the Red Sea event. By his reckoning this would move the Hyksos period up around 200 years from its usual chronology. Which makes more problems for him to solve than it brings clarity. The optimistic archaeological finds between this team of Mahoney and Rohl does not end with the statue of Joseph. Their treatment of the Ipuwer Papyrus, is speculative for the most part as the poet Ipuwer is dated by most Egyptologists to well before the time of the Exodus. Maybe Mohoney and Rohl believe in the Egyptian prophecy that Ipuwer is expounding. This movie, in my opinion, had so much potential but ultimately was disappointing. There is a certain amount of ambiguity to Archaeology as I understand it but these two made far too many claims to certainty. To cap it all off with a 4 member panel discussion hosted by a Fox news anchor, in the words of my friend Matt Bevens, “was like shooting themselves in the foot with a colt .45”. Was there heresy taught? No. When given two conservative options, did they choose the crazy-third-out-in-left-field-option? Yeah. It might have missed the target but at least it had one. They say the “only way to move cattle fast, is slow.” When working with an animal who’s IQ is abysmally low, their fight/flight instinct is virtually indistinguishable, and a stubborn streak is readily observed, there really is nothing that goes quickly. I have seen them break for open ground, stand still and refuse to move, or turn around and run over anything that moves. They run through fences, run over feed bunks, but will balk at water in a ditch. Cattle, not unlike middle school students, can ruin the best-laid-plans. Patience is a virtue when it comes to ranching. It takes years to accumulate the land, the cattle, the equipment, and the know how. The cold winter, the wet and muddy calving season, and the sweat spilling summer was spent getting ready for one fall pay-day. There are few quick solutions in ranching. It is a patience building profession. The nation of Israel found themselves in the patience building phase of their journey at the end of Exodus 24. When it comes to chronology, there are two main types of stories in the Bible and each communicates a different message about God and His people. The first type of story is probably more well known and it takes place over three days. John Ortberg, in his book Faith and Doubt, calls these microwave stories. Microwaves make quick work of everything. Cold cups of coffee become warm in 15 seconds; leftover pizza in 30. On a cold morning, socks get warmed up in 10 seconds before being put on…like you guys don’t do it! The microwave works quicker than a dryer. Three-day-microwave stories put the character and activity of God at the front and center. They are stories of “crisis and urgency”.1 Desperate circumstances surround the microwave stories. It was three days after the Israelites were deceived by the Gibeonites, when they realized their mistake (Joshua 9.16). It was three days that the people had to prepare to enter the promised land (Joshua 1.11) and three days the spies hid after meeting Rahab (Joshua 2.16). When David has sinned against the Lord (2 Sam. 24.10), as a consequence, the Lord offered up three options: “Three years of famine…three months of fleeing…or three days of plague?” (2 Samuel 24.13) David, in his own words, describes the situation as “deeply distressful” [sara] (2 Samuel 24.14) a word reserved for the most dire of circumstances. There is also the three days Nehemiah waited in Jerusalem before checking the wall (Neh. 2.11); the three days to confess sin to Ezra (Ezra 10.9); and the three days Jonah was fish food (Jonah 1.17). Of course, the most famous three day story, Jesus resurrection account. Where the words “on the third day” took on a fuller meaning. Three-day-microwave stories point to a need for God to do something, a need for Him to show up, a need for his action. Moses experienced a three-day story when the Lord gave a three-day heads-up before the fireworks of his arrival on Sinai (Ex. 19.15). Moses knew what a three-day story looked like. But in Exodus 24 another type of story emerges. The 40-day (or year) story, which Ortberg calls a Crockpot story, is one of patience and perseverance. It is a sit-around-and-wait story where people are tried and tested. Crockpot meals set all day and simmer. They take a while to heat up. These are the stories the take time to develop, but develop the people they involve. Jesus began his ministry with a 40 day fast in the desert (Matt 4.2) and he ended his time on earth with 40 days before his ascension (Acts 1.3). Noah and his family waited through 40 day/night rain on the earth. Through tense and tumultuous seas, Noah and his family waited in the ark. (Gen 7.12) For 40 days Goliath defied the armies of the Living God (1 Sam 17.16); Elijah hid from Jezebel on Mount Horeb for 40 days and nights (2 Kings 19.8); and Ezekiel slept on his side for 40 days (Ezekiel 4.6). Moses would become very familiar with the Crockpot story. The spies would be in the Promised Land for forty days (Numbers 13.25) and when they brought back a bad report and the people were unfaithful, they would wander in the desert for 40 years (Numbers 14.34). Even Moses life was a testament to perseverance and Crock-pots. He was in Egypt 40 years learning leadership from the most advanced civilization of its day. Then he spent 40 years in the desert chasing sheep, un-learning his Egyptian ways and learning God’s way of leadership. Finally, he would spend 40 years leading the people in the desert. In Exodus 24 the Crockpot story was for the whole nation of Israel. Moses and Joshua headed up the mountain to meet with God. They left Aaron and Hur to lead the people (Ex 24.13) Moses stayed on the Mountain for 40 days and nights (Ex. 24.18). For the next 7 chapters, Moses is on top of the Mountain hearing from God and writing things down. Aaron, Hur, and the people are partying down below. In the “have patience-Crockpot story” the people couldn’t wait and became corrupt (Ex 32.7) Because they “didn’t know what happened to him” (Ex 32.1), they made for themselves an idol. So what are we to make of this story? The forty days of waiting? Forty days is a long time to wait…to learn. Our forty-day terms can be a wait for a diagnosis, a period of unemployment or under-employment, a rebellious child, an extended disagreement with a spouse. God shouts in the three-day stories, but he whispers in the 40. God is always on a mission to reach us, speak to us, teach and lead us. For 40 days, he sought to teach patience to Israel. Are we learning in the Crockpot? What are we learning in the slowness and the still? 1 Ortberg, John. Faith & Doubt (Zondervan: Grand Rapids, 2008) 91. If you could pick anyone to have dinner with, who would it be? Your top 5 list? Mine would start with 1) Mike Rowe at HHB Barbeque. He anchored possibly my favorite show of all-time, Dirty Jobs, and has become an outspoken defender of blue collar America. He’s done it all and reported on it all. 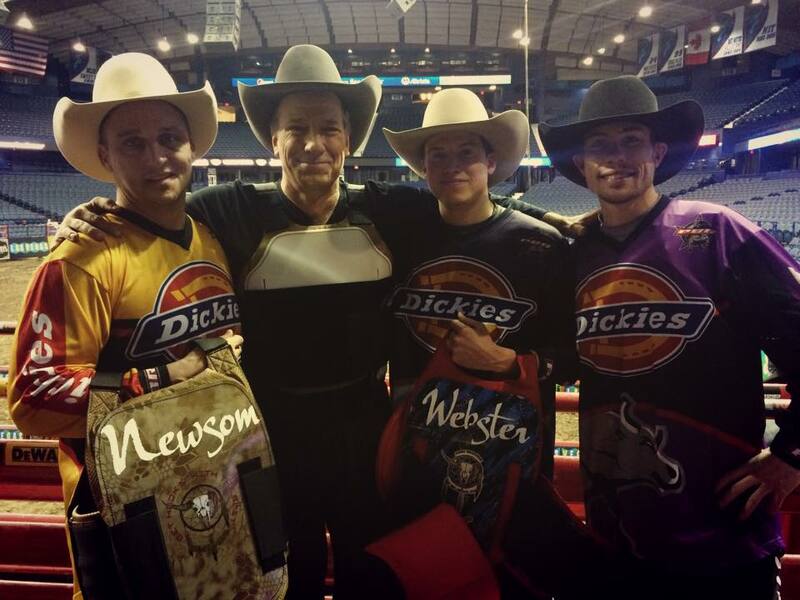 His most recent experience was fighting bulls with the Dickies Durabull Fighters at PBR Chicago. 2) Kevin James (and if Joe Rogan wants to stop by as well) seems like the type of guy that could have a pretty good time with. 3) Paleontologist Jack Horner. As the world foremost dinosaur expert, I would need a commentary on the Jurassic Park movies from him. Besides he put forth a thesis back in a 2009 book that hasn’t progressed in five years and I want to know where he’s going with it or if he has abandoned it. 4) John Erickson, author of Hank the Cowdog. We have communicated via letter for a year now but would love the chance to sit and talk about his ranch in Perry, Texas. He was planning on going into ministry until he decided to self-publish. He has done well for himself, but I think he would have made a great pastor as well. 5) Lucas Littles, Angel Garcia, Wilmeth, Brent Irwin, and others from the Williamson dorm at Ozark. Its been 7 years since I graduated. Its been a long time since we have been able to hang out. I could use some El Charro or Cheddars. Honorable mention (the men who didn’t quite make the list): Aaron Rodgers and Jordy Nelson, Jimmy Fallon, Buck Brannaman, Kevin Durant, Dan Patrick, Bill Watterson. Who would be on your list? Who would you have dinner with? The nation of Israel got their dinner wish in Exodus 24. Moses had just gotten down from the mountain and he relayed all the words of the Lord to the people. They spoke up in one voice: “we will do what He has commanded.” And here, just as it is today, God knew that talk alone doesn’t solidify a people. God has always known that people who “do” remember better than people who “say”. Moses had read the Book of the Covenant (Exodus 20-22) to the people (Ex 24.7) and then acted upon it (24.8). Now comes the celebration, the seal, to confirmation. Moses, Aaron, Nadab, Abihu, and the elders assembled and headed up the mountain. How far they went up (24.9) the mount is unclear because Moses and Joshua would go further up (24.12-13)? It seems as though the elders did head up, at least a little ways, the mountain because the command of God was “not to set foot on it” (19.12) and here God does “not raise his hand against them”. (Ex 24.11) The message is made clear elsewhere, that those who see God will die (Ex. 33.20). So why are these leaders allowed to gaze at God? The covenant has just been confirmed with the blood being put on the people. Now, the covenant is celebrated with a meal. Both parties that entered into the covenant would meet over a meal to ratify, confirm, celebrate, and acknowledge the agreement. So the elders meet with God to eat and drink. They saw God and did not die. It was a meal that would forever change the people who took part in it. The Mosaic Covenant would govern the interactions between God and His people up until Jesus would come. It was a meal that was unforgettable. Will James worked his way through the west, ranch to ranch, which gave him background for some of his greatest cowboy stories. John Erickson, of Hank the Cowdog fame, worked ranches in the panhandles of Texas and Oklahoma which gives depth to the ranch that Hank runs security on in his 50+ books. Baxter Black spent years as a large animal vet in feedlots and ranches throughout the Rockies and rubbed elbows with farmers and ranchers who have lived the stories and poems he pens. These experts in cowboys and cowboy life lived what they wrote. Sunday morning the Church where my wife attend when we’re in town, began a 66 week series through every book of the Bible. A few years back, for a youth group lesson, I bought a book called Manga Mutiny, a manga re-telling of Genesis to the middle of Exodus. It was the only way I could get some of our students excited about the book of Genesis. But I was challenged when I first opened up the book and it began in Exodus, with Moses around a campfire talking with his people. It was then that a flashback took over the book, with Moses narrating the events of Genesis. Genesis was compiled and written by Moses. I hesitate to use the word “compiled” for fear that it may be misunderstood as an embrace of source criticism and confused with the documentary hypothesis. These theories of the origin of Genesis and the Torah, are radically mistaken. In studying the structure and purpose of Genesis, as well as its connection to Exodus and the rest of the Pentateuch, it would make sense that Moses would compile information and utilize sources in documenting the history of his people. Genesis is divide into 10 sections, or toldoth’s, accounts of men and their lives. Men like Adam, Noah, Abraham and others, each have a toldoth that documents their activity and their progeny. In Genesis 5.1, the word translated “written account” [sepher] is always used of physically written accounts, which differentiates this account from the other toldoth’s in Genesis. This argument points to Moses composing Genesis with some kind of source material…but where would he find it? There are three theories that dominate the location of composition debate surrounding Genesis. Theory 1 argues for an Egyptian origin. The use of Egyptian vocabulary throughout Genesis, argues that the author was definitely familiar with Egyptian society and culture. This theory also accounts for the sudden rise in nationalistic identity within Moses in Exodus 2.11. All the school of the palace could have involved a history lesson about Joseph and the shepherds, though doubtful becasue of the tension caused by the New King who didn’t know Joseph or his people (Ex. 1.8) This theory looks to minimize the burning bush conversation as the catalyst for Moses’ actions and relationship with the Lord (Ex. 3-4). A second theory has been put forth by Dr. Thomas Sharp in his Creation Truth Foundation video, Evolution: The Greatest Deception of All. He argues for a composition of Moses after the Lord shows his backside. The last time he descended the mountain, he found the people partying around the Golden Calf (Ex. 32). He smashed the tablets containing the words of the Lord in disgust (Ex 32.19). Now at the Tent of Meeting, Moses is speaking to the Lord and asks to see His glory (Ex. 33.18). God says that “you will see my back; but my face must not be seen.” (Ex 33.23) He passed in front of Moses and Moses saw his backside [‘achor]. Sharp postulates that backside is a metaphorical term for past works. At this time, Moses instead of seeing the trailing end of God’s glory [kavod], he is seeing God’s past works. The problem with this interpretation lies in the understanding of ‘achor as a literal term. Moses saw something tangible from that cleft. ‘achor is never used in a metaphorical sense in its 41 uses in the Old Testament. It is used of literal retreats by armies, people being turned back from a place, and literal hindquarters. I am not suggesting that God had taken a bodily form, for that would mis-apply the anthropomorphism, however, Moses saw something there, not a flashback. When was Genesis composed? I believe there is a case to be made for Moses’ first trip up the Mountain of Sinai in Exodus 19 for a couple reasons: 1) “keep my covenant” (19.5) is a reference back to the covenant that God made with Abraham in Genesis 12, 15. Exodus 2. 24 mentions this covenant and it is at the forefront of the setting of the book of Exodus, the journey out of Egypt. This is the most recent covenant, the one they are living under now, from 600 years prior. 2) “out of all nations you will be my treasured possession” (Ex. 19.5) Where did this thinking and this story originate…Genesis. The book of Genesis is very clear about the value that God placed on His people. The reason for their value originated in the story of Genesis. 3) “the whole earth is mine” (19.5) can only speak back to His creative process found in Genesis 1-2. 4) This is the first extended conversation that Moses has had with the Lord outside of his calling in Exodus 3-4. During that discussion God and Moses focused on the problem at hand, with no natural place to put a history lesson. Taking these three reasons under consideration, as well as the other two theories faults, I believe that Exodus 19, provides the best context for Moses composition and understanding of Genesis at the word and commission of the Lord. Fourteen thousand feet above sea level the air gets kind of thin. It gets even thinner as a couple 50 year old men run (yes run) by. The runners were from back east who were spending their vacation time running up and down fourteeners (mountains whose peaks are between 14,000 and 15,000 ft above sea level) in the Rockies of Colorado. They passed me like I was was standing still. Mt. Princeton wasn’t a terrible climb, but it was long. I, along with about 10 other family members began our ascent around 630 and reached the summit around noon. The trek down was just as arduous. Later that afternoon, there was a picture taken of me asleep on a river bank with weary feet in the water. It was a cruel realization that I wasn’t physically what I used to be…and that is part of what makes me so interested in Exodus 19. Moses was 40 years old when he struck the Egyptian and fled Egypt (Exodus 2.11-15; Acts 7.23). In Midian, he spent forty years following flocks of sheep over the same sands that he now walks. At 80 years old, Moses is now called into ministry. (Acts 7.30) On the very mountain that God would speak to him from a burning bush, Moses now speaks with the Lord agian. 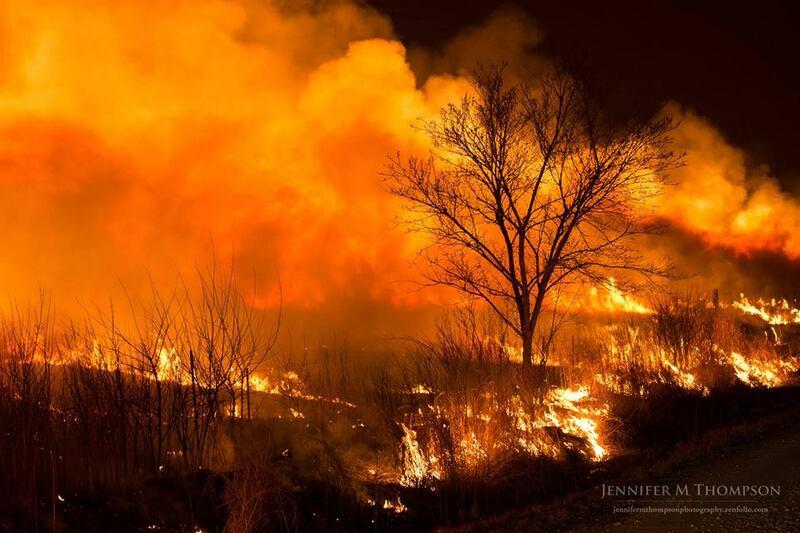 Instead of a burning bush, the whole mountian looked ablaze. Instead of an audience of sheep, an audience of God’s people. Exodus 19 is a precursor, a laying of ground rules, to everything that would eventually include the Book of the Covenant. Moses went up the Mountain to God (Ex. 19.3). God told him that they were his “treasured possession” if they obeyed. Moses went down the Mountain to the people (Ex 19.7) where he gave them God’s message and he people responded that they would follow God. Moses went up the Mountain to give the people’s answer to the Lord. (19.8) God told them to get ready. Moses went up the mountain when God had covered it with a cloud. (19.20) Again God warned the people not to touch the Mountain or approach it, but this time it was accompanied by some pretty awesome pyrotechnics. (Exodus 19.16-19) Next time he was to bring Aaron up with him. Moses must have looked more like the runners than I did on my climb. An 80 year old man should not be climbing mountains, especially four times. If a moment is taken too bracket the discussions between Moses and the Lord with the ascents/descents of the Mountain, the structure of Exodus 19-20 takes on an interesting crescendo. On the first trip up, there was a short discussion, most of it centered on the identity of Israel (kingdom of priests; treasured possession). The second stay on top was a bit longer talk with God that was heavy on instruction about the Mountain and what was to happen. The third trip really built upon the second. Finally after all these trips up and down the Mountain, Moses and the people receive the 10 commandments. The foundational blocks upon which all else falls. I was baffled that God, in His infinite wisdom and love, would ask an 80 year old guy to march up and down the path of Mt. Sinai. But I must ask: why? It communicates how much God went through to give His teaching, revelation, and instruction to man. Because it “was for our instruction” (Ex 24.12) that God gave his commands and decrees. The whole narrative, no matter the elevation of Moses, was about obedience and instruction. It wasn’t just God marking the spot with an X and Moses finding a stone with all the words inscribed on it. There was a lot to God communicating with man…even if it meant one man doing a lot of running.